Laterna Magica: MtG programming: Replicating Game States - Working code! Replicating Game States - Working code! Before you get too excited - no, there's no multiplayer yet (well, who would have guessed that...). There is, however, working code for undoing and redoing actions (even with multiple, branching histories), and even for replicating the state on multiple virtual machines. Of course, a history for the modifications must be created. Then, the history is set for the thread: Code running in the thread (that is, everything in this method, and nothing more) can access the history without passing it as a parameter (which would make using the library awkward) or declaring it as a static variable somewhere (which is ugly from an architecture standpoint.) Everything after this is wrapped in try/finally, so that the last method is not skipped in case of an exception: this removes the association of the history with the current Thread. 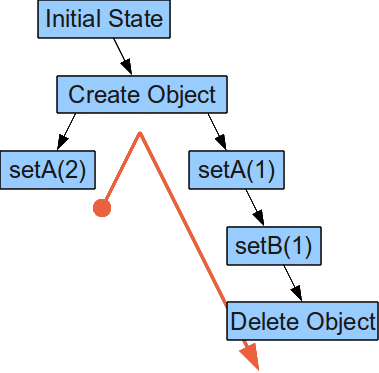 This is the actual test case I ran: I went back to the state after creating the test object, changed its a value, and then switched over to the state before, and then after, deleting the test again. I have code for replication of states going, but it's not yet as clean as for undo: a lot of handling is necessary for the network, which should be transparent to the user. I'll show it once I'm finished, but in the meantime you can look here.